NetBet Casino makes sure to put at the disposal of its members entertaining games. The slot machine Castaway is currently available in the gaming room of this online casino and it could satisfy fanatics of adventure games. Its an excellent masterpiece of the developer Leander Games and it gets its inspiration from the novel written by Daniel Defoe. The game highlights the adventures of Robinson Crusoe. The latter was victim of a shipwreck at the age of 28 years, and he lived a quaint adventure at the heart of a tropical island. 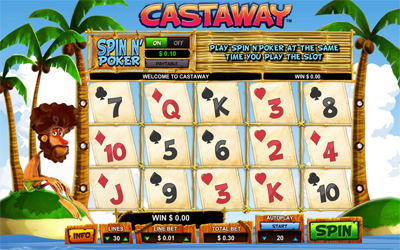 The gambling machine Castaway is endowed with 5 reels and 30 paylines. It inherits also from numerous wild symbols representing the figure of the hero of novel and scatters just like an ace of hearts which give a particular advantage to players thirsting after victory. When the latter see three scatters appearing on the reels, they benefit thus from a bonus game. So, two bottles will appear and they contain each a parchment heading a message. That may be free tours or bonus called Multihand Infinite Hold'em, allowing players winning coins and playing Texas Hold'em poker. By forming a combination of winning cards, the latter will get an important bonus, with an amount oscillating between 20 and 5,000 coins. This very funny game exists in demo and real version. For those who intend to play in real mode, the participation fee oscillates between 0.05 and 0.5 coin.